Place your apples slices on a baking sheet. Dry out the apples in the oven (preheated) until they dry out, which takes about 45 minutes to 1 hour. Enjoy! Serve up with drinks, maybe cider, and apple donuts. Wash and core the apples. Slice apples into ¼ inch thick slices. Place the slices on the trays of an Excalibur dehydrator evenly spaced. 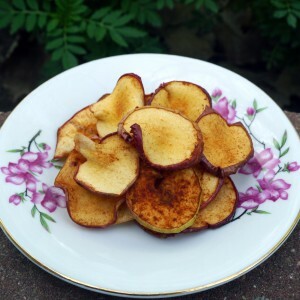 For a sweeter flavor, sprinkle the slices with cinnamon and sugar prior to drying. Set the dehydrator to 135°F and dry until pliable, approximately 10-15 hours. When done let them sit on a cookie sheet for a few hours. Put in an airtight container or zip lock bag and store in a dark dry place.